Founder Mrs. Betty Lockhart wrote a letter to a local newspaper, inviting anyone interested in forming a historical society to meet at her home to discuss it. On June 4th, 1970, 54 persons attended the first meeting held at the Porch Club and voted to form such an organization. They decided to meet twice a year and elected Mrs. Lockhart as its first president. By 1974, the organization had drafted a constitution and bylaws and became incorporated. Mrs. Marilyn Colozzi wrote a one-page undated newsletter containing announcements of activities which the group christened the Gaslight News, named for the quaint streetlamps which, at that point, PSE&G had earmarked for removal. That modest beginning was the start of the Historical Society of Riverton. Due largely to the activism of HSR members, those original 52 gaslamps were saved in the late 1970s, thus preserving the Victorian atmosphere of the town. Other preservation efforts include transferring the silent film, Romance of Riverton, to video, microfilming four late 19th and early 20th century local newspapers, and the nomination of Riverton’s Historic District to the New Jersey and National Registers of Historic Places. ¨ Team Leader Rob Gusky organized the Historic Riverton Century in 2014. He added a 3-Mile Community Ride in 2016. Early morning rides, a Bike Safety Rodeo, a Community Ride, and Carlos Rodgers’ Historic Riverton Criterium comprised Riverton’s 2017 Historic Weekend of Cycling. ¨ In 2017, the Society began the expensive and time-consuming task of securing, storing, and cataloging Society files, archives, and artifacts now housed in the basement of Riverton Free Library. ¨ The HSR began an initiative in 2017 to partner with property owners to research and install about ten historical markers throughout town. 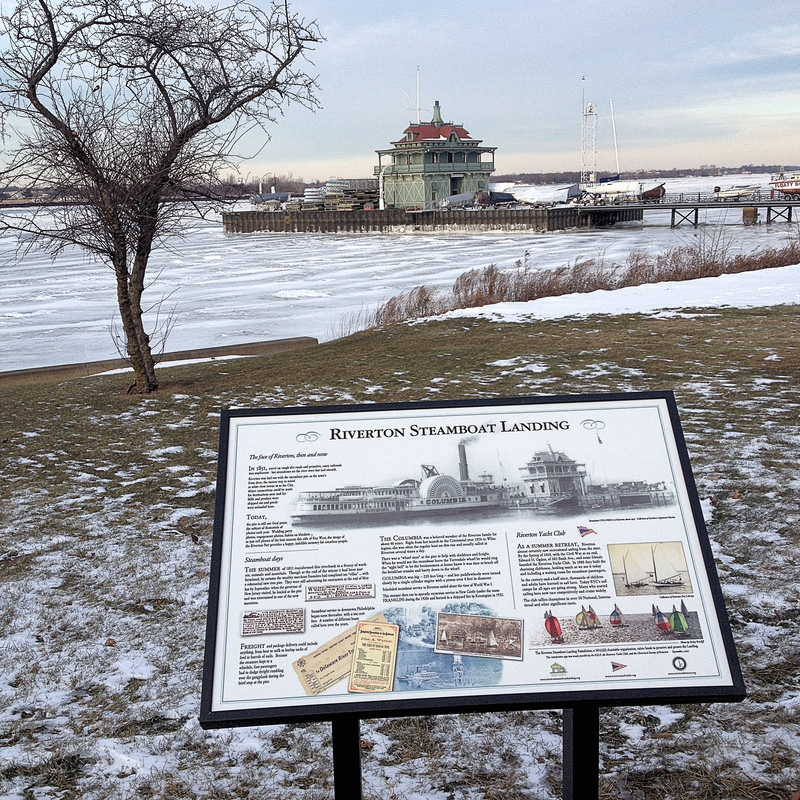 Already in place are signs at founder Caleb Clothier’s house at 503 Bank Avenue and at Riverton Yacht Club. Underway are signs at Riverton Public School and Riverton Free Library. Will you help support the Historical Society of Riverton’s preservation endeavors with your membership or give a donation? Jersey, but not limited thereto. The Society’s mission is to create an awareness of our heritage, to discover, restore and preserve local objects and landmarks, and to continue to expand our knowledge of the history of the Riverton area. Click on the image at left to view a PDF of our Constitution and Bylaws. Membership is open to the public by contacting the Historical Society of Riverton. Greek Revival Style home of a founder of the Riverton Improvement Company, Caleb Clothier, who was a prominent bricklayer and flour merchant. Caleb is best known for the work of his son Issac Clothier who partnered with Justin Strawbridge in organizing the Philadelphia department store Strawbridge & Clothier. According to Bill Washington, author of Historic Riverton 1775-1930, the Riverton Improvement Company purchased 120 acres of land bordering the Delaware River. Samuel Sloan, a noted architect of the day, was hired to lay out the community. Sloan laid out the town with building, street and fencing parameters intended to retain a sense of open space. Contrary to the traditional city grid layout, Sloan laid out the streets irregularly, with some straight and some curved. This created the 105 lots that were not uniform in size and/or shape. The community would serve as a regional origin and destination for water transportation, and a steamboat pier was included as one of its primary features. Riverton Public School celebrated its 100th anniversary in 2010. Riverton’s first “big” schoolhouse was built at the corner of Fourth & Howard Streets in 1892 by contractors Grant & Lowden at a cost of $4,400. Burlington County’s first kindergarten was in Riverton in 1897. The Riverton Fourth of July Parade began in 1897 as “The Children’s Parade” featuring children in costumes on decorated bicycles and carts. In 1915, over 500 children marched in the parade. The glow of 80 Victorian style gaslights illuminate Riverton’s main streets; they include 52 original gaslights and 28 reproduction gaslights. Prior to his election to the Presidency of the United States, Theodore Roosevelt visited Riverton and stayed at the home of Samuel Allen, a Pennsylvania Railroad executive, who lived at 404 Lippincott Avenue. 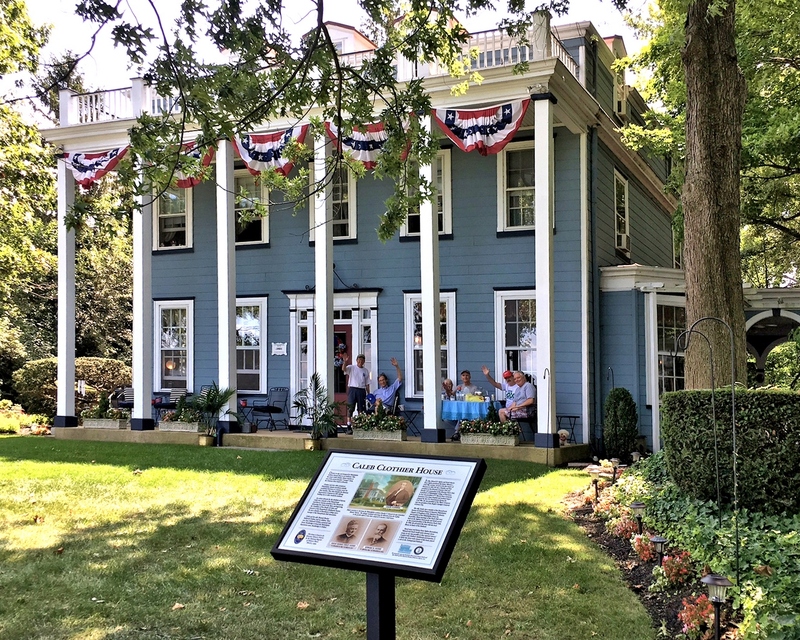 In September 1998, Riverton received approval as a New Jersey Historic Register District containing 526 structures and in 1999 it was designated a National Register District. The New Leaf Tea Room & Gift Shoppe building at 606 Main Street celebrated its 100th anniversary in 2010. It was originally built in 1910 to serve as the William H. Stiles Drug Store. New Jersey’s Parent Teachers Association originated in Riverton in 1900 by the Mother’s Circle group of the Riverton Porch Club. In 1891, the Riverton Fire Company paid $2.00 to the first man arriving at the engine house with a horse to pull apparatus to a fire. Riverton Yacht Club, organized July 1, 1865, today stands as the oldest yacht club on the Delaware River, ninth oldest in the United States. A national class sailboat, the Duster, began in 1933, in the third-floor workshop of Jim Merrill and his father Commodore E.K. Merrill at 301 Main Street. These fascinating facts about Riverton are from palm cards collected by former Society Treasurer, Paul Daly, who distributed the cards during the Fourth of July Parade.